Summer reading season is in full swing. We are loading up our beach bags and e readers with books to fill long, lazy summer days. Everybody is searching the internet for the best books of 2016 and summer's best beach books. Personally, I love to read all kinds of books, from mystery and suspense to fantasy and science fiction. I love being able to travel, within the pages of a book, to places I have never before visited. But, I am especially thrilled when I have been to the places described in a book, because it makes the stories even more real. When I went to Seattle and the Olympic Peninsula, I read books about Lewis and Clark and their expedition to the Pacific northwest. When I visited Santa Fe, I found myself caught up in Tony Hillerman's mysteries involving the Navaho people. And on a trip to Hawaii, I immersed myself in James Michener's, Hawaii, while the beautiful Hawaiian sunsets were still fresh in my mind. Of course, the place I know best is my home state of Alabama. Not only is Alabama a place that breeds great writers and storytellers, it is a state rich in southern culture and beauty. From the foothills of the Appalachians in the north to the Gulf coast in the south, Alabama ranks fifth in the country in biodiversity. Our cultural history is rich, too. Alabama is the cradle of the Confederacy and the birthplace of Civil Rights. Alabama's sweltering humidity, thick southern drawls and poor farm towns have been a perfect breeding ground for creativity that matches or exceeds that of any other state in the country. 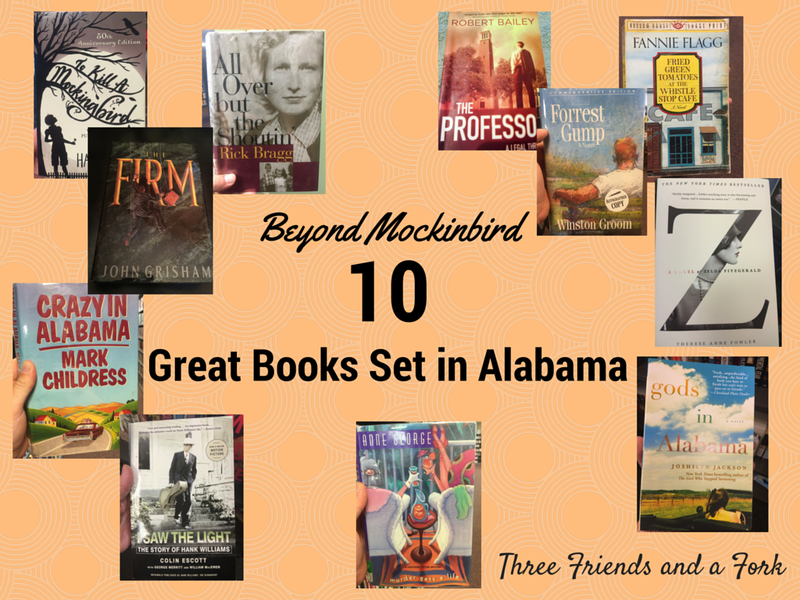 Writers like Harper Lee and Truman Capote and musicians like Tammy Wynette and Percy Sledge all got their soul from roots grown deep into the Alabama dirt. In Fried Green Tomatoes, the fictional town of Whistle Stop sits on the railroad tracks, just like the real Alabama town that inspired Flagg's story. Irondale is a suburb of Birmingham and it is home to the original Whistle Stop Cafe, only its real name is the Irondale Cafe. The railroad tracks run right in front of the Irondale Cafe, and just like in the book, you can order a delicious plate of fried green tomatoes while you read about the lives of Ninnie and Idgie Threadgoode. Though Gump grew up in the fictional town of Greenbow, Alabama, he managed to to run across the country, stopping off in real Alabama towns such as Tuscaloosa and Bayou La Batre along the way. Fry, grill, or boil up a big platter of Alabama Gulf coast shrimp and nibble on a box of chocolates while you immerse yourself in the homespun wisdom of this sweet man and the mama who only saw his abilities. I said there was no order of favorites in this list, but if there were, I would be hard-pressed not to put Gods in Alabama right at the top. I swear I know these people. Heck, I think I'm related to some of them! Set in the fictional Alabama town of Possett, Alabama, Arlene Fleet comes back to Alabama after a long absence and confronts the demons of her past. Grab a glass of sweet tea and enjoy! Anne George wrote a whole series of books based on the antics of sweet, well behaved, Patricia Anne and her out of control sister, Mary Alice. The sisters live in Birmingham and a lot of their capers take place in and around the Magic City. All of the mysteries in the Southern Sisters series are light, fun and easy to read, but I chose this one because it has a recipe for Vulcan's Buns in it. Bake them up one night and start reading! The Firm was the first book I ever read by Mississippi author, John Grisham, and it is still one of my favorites. Brand new attorney Mitch McDeere learns the hard way if something sounds too good to be true, it probably is. In an effort to save himself he flees to Alabama's Gulf Coast. Have a bushwacker and dive in! It is a suspenseful trip. I am actually in the middle of this novel based on the real lives of Zelda Sayre Fitzgerald and her husband, F. Scott. The story begins in her hometown of Montgomery where she first met the yet to be famous writer. Nibble on real homemade Alabama biscuits and peach jam, Zelda's favorite food, while you lose yourself in this fictional account of the very real Fitzgeralds. Colin Escott, a Toronto native, with as far from a southern accent as one can get, sure knows Alabama's Hillbilly Shakespeare, Hank Williams. He takes us on a journey through the life of the singer, born in the tiny community of Mt. Olive, in Butler County, Alabama, which happens to be near Harper Lee's hometown of Monroeville, Alabama. Hank wasn't much of an eater, but he did have a "tear in his beer", so crack open a cold one and go on one last ride with old Hank. 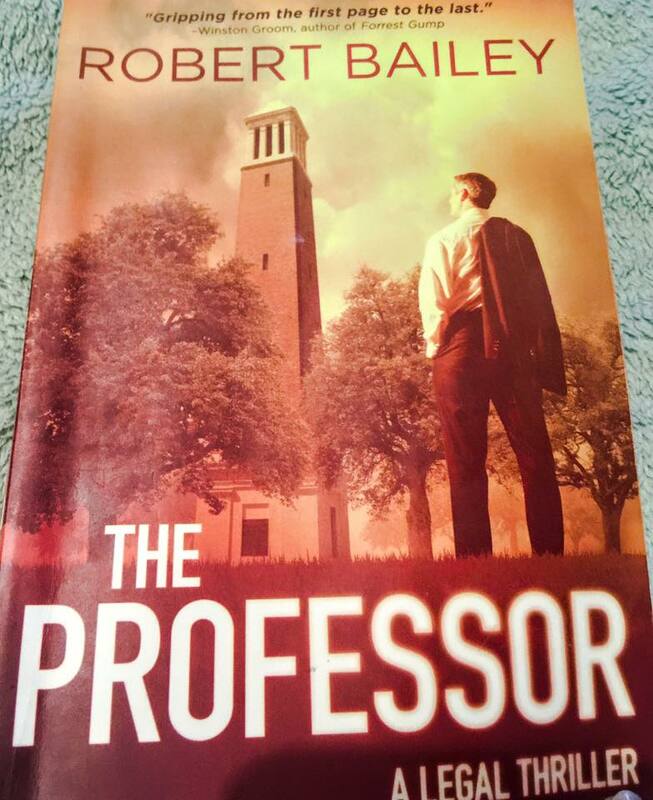 New Alabama author and Huntsville native, Robert Bailey, is a civil defense attorney in the Rocket City. 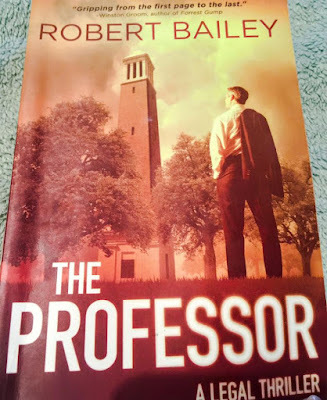 The Professor is his first book and it was so good, I quickly bought his second book, Between Black and White, the first day it hit the shelves. In The Professor, Bear Bryant's influence is heavily felt, so enjoy the Bear's favorite, Golden Flake potato chips and an ice-cold Coca-Cola ("It's a great pair", says the Bear. ), while you dig into this suspenseful tale of corruption and greed. Even for an Auburn fan, like me, it is a great read! There is a saying that southerners don't hide their crazy in a closet, they bring it out on the front porch and offer it sweet tea. While there may be some truth to that, Crazy in Alabama takes that to an extreme. Interestingly, author, Mark Childress, also grew up in Monroeville. What is it about that place? Drag out your old Tupperware salad crisper and crunch into a leafy green salad while you laugh and cry along with Peejoe and his family. Author Rick Bragg grew up in Piedmont, Alabama. All Over But the Shoutin' is the story of his hard-scrabble life in the small town and how he overcame the obstacles of being born poor white trash. His father was abusive, but his mother never let him lose hope and never let him quit dreaming. Pour a cup of coffee and get a box of tissues as you root for Bragg and anyone else who refuses to give up, even when the odds are stacked against them. 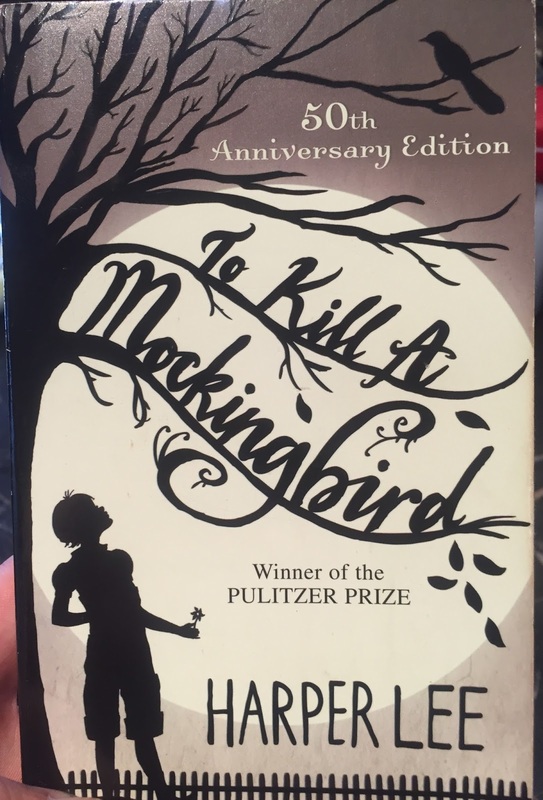 So, there you have it...my ten beyond Mockingbird. What are your favorite books set in Alabama? Please share them here so we can all enjoy. Now, let the summer reading begin!